Optimism is overrated, says author Marilyn Schoeman. “I support an optimistic attitude, it just doesn’t go far enough. It is a good beginning, yet it doesn’t necessarily lead to a good ending. The Green Light Secret is ACTION,” a core principle in GO!. Others include “Green Light thinking elevates the art and skill of asking questions”, “Green Light style starts with identifying the Ideal Scenario,” and “Green Light leadership unleashes creativity and fosters innovation.” The Green Light Goal: Create the greatest good, in the best way, for the most people, for the longest time. Green Light is a new mind technology. It’s a conscious choice. “GO! 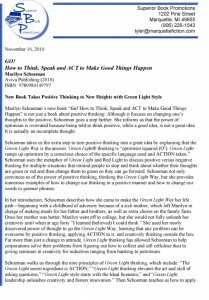 How to Think, Speak and ACT to Make Good Things Happen” is available at www.GoGreenLightWay.com , Amazon and Barnes &Noble. ISBN# 978-0-9841497-9-7, $19.95; paperback. In GO!, author Marilyn Schoeman explains how to use the Green Light Scale to identify where you are and where you want to be. Then you use Green language, questions and actions to move away from three Red Lights and toward the three Green Light signal. She also reveals nine key principles for accessing more of life’s riches – greater success, better relationships, expanding joy. Green Light helps people consciously reduce the negative static in their lives – and achieve higher performance, with greater impact. This tool helps you avoid Red Lights and get Green ones, to gain GOmentum. Move toward the Ideal Scenario. Her book is filled with humorous and practical examples of how the Green Light system helps everyone transform the status quo into status Go! “You don’t have to be a super achiever to use the Green Light system—although you may soon become one,” asserts Schoeman, “The tool is easy to use and quick to produce results.” Adults and youth start using it right away. It’s as simple and as sophisticated as your goals. Get GOing for the Greenest results. Marilyn Schoeman, of Seattle, is an international keynote speaker and business consultant. She is described as a visionary think tank. Honored as a “Champion of Creativity” by the American Creativity Association, her mission is to dramatically expand creativity – to super-charge professional success and personal fulfillment. Delighting audiences at a wide variety of conferences, business events, and educational summits, Marilyn has delivered presentations around the globe. Her clients include Helsinki University, IBM, Harborview Medical Center, Resources Development of Egypt, REI, DuPont, Boeing, Young Presidents Association, Yan Shan University/Qinhuangdao, China, TI-IN TV Network, and state agencies in Iowa and Washington. She has served as an adjunct instructor at several universities. As a creative strategist, Marilyn facilitates and generates breakthroughs – for products, marketing, operations and profitability. She also partners with organizations to implement the Green Light® system, dramatically improving employee satisfaction, corporate culture and sustainability. Often called the Green Light Lady, Marilyn helps people gain GO-mentum.